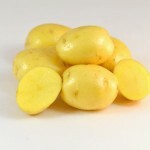 Large oval tubers of a uniform shape and size with an attractive smooth light yellow skin and flesh color. Can be cultivated under various climatic conditions, with good virus and late blight resistance. Suitable for medium-term storage. Rather firm when cooking, also suitable for the ‘Baker’ market. Mid Season maturing and produces a high yielding oval to oblong white skinned tuber with medium/shallow eyes. No after cooking discoloration, excellent for french frying, baking or boiling. Ideal for fresh market. Medium Maturing. 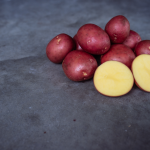 Produces high yield of round/oval bright red tubers with shallow to medium eyes and good color after boiling. Resistant to late blight, PVA, and stem end browning. Highly resistant to common scab and tuber net necrosis. Merida has smooth yellow skin and light yellow flesh, and a nice short oval shape with very shallow eyes. It is early maturing with high disease resistance and long dormancy. Merida has excellent flavor, very uniform grading and a high marketable yield. Culinary qualities include roasting, boiling and steaming. 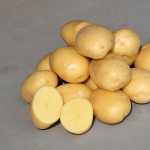 Oriana is an early maturing high yield luxury variety with round to oval uniform tuber shape. Higher than standard fertility, medium storage ability. Oriana has excellent skin finish with yellow skin, pale yellow flesh and shallow eye depth.It is an ideal gourmet variety, bakes, mashes, roasts and boils well. Mid Season maturing & produces a very high yield of round/oval bright red skinned tubers with white flesh. Red Lasoda is heat & drought tolerant with a wide adaptation to both northern and southern areas. It is excellent for baking. Oval slightly flattened tubers with yellow skin and light yellow flesh. Common yellows are often passed off as Yukon Gold, but it can be identified by it’s shallow pink eyes. Yukon Gold can grow quite large and stores very well. Excellent taste and extremely good for baking, boiling, roasting, frying and in casseroles or scallops. 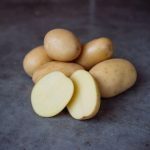 Rosagold is an attractive, red-skinned table potato with excellent skin finish and good resistance to common scab and virus. 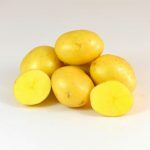 This high-yielding, yellow fleshed variety produces plenty of round oval tubers of uniform shape and is well suited for use as either a table variety or home cut fries. Excellency is a fresh market variety with processing capabilities. It has yellow skin and light yellow flesh. Tubers are long oval, rather big and have very shallow eyes. Tuber numbers are moderate. Excellency has a moderate dry matter content with a floury texture. It has good frying quality, as well as cooking and chipping qualities. Excellency grows on most soils and is of interest to the processing market and packers as it has clean skin finish. © 2019 Pacific Potato Corporation. All rights reserved.